I recently wrote a short blog on my experiences in entering photographic salons both locally in South Africa and Internationally and what it does for my own photography. My photographic friends told me that there are a few salons that you have to enter Internationally like the Trierenberg Super Circuit and the Al-Thani awards to name but two. As the deadline to the Trierenberg Super Circuit approached I was putting it off from entering as I have found the process pf selecting images to enter into salons and competitions very difficult as I can’t decide which images to enter. However after phoning a friend and then understanding the categories I picked 12 images over 3 categories i.e. Open, Nature and African Wildlife which I then submitted 3 days before the closing date. The images I selected have a strong “story telling” factor which I believe is important to support a technically correct image. All the images submitted would be judged in 4 different salons and need to receive at least 3 acceptances per image to receive an overall acceptance in the Trierenberg Super Circuit. Not giving it much further thought I was left speechless when I received the email from the organisers which informed me that I had won the PSA Gold Medal for the Nature category. The category is judged on the portfolio of 4 images submitted and not on a single image as I initially thought. The images I submitted came from 3 of the destinations to which CNP Safaris offer photographic safaris i.e. the Chobe River in Botswana, the Maasai Mara in Kenya and the Kgalagadi Transfrontier Park in South Africa. In total, of the possible 48 acceptances across the 4 clubs, I received 44 acceptances in total. The images of the lion cubs was taken on a CNP photosafari safari in the Maasai Mara when three cubs together with their mother and father were lying on a termite mound in the sun. We sat with them for quite some time as the cubs slowly moved around, climbing over their mother. When they wanted to start suckling the mother suddenly stood up and left the 2 babies crying for more. The next image was taken from our CNP Safaris boat on a photosafari to the Chobe River in Botswana. I found this Coppery-tailed Coucal along the shores of the Chobe River sitting deep in the reeds holding something green in its beak. I was expecting it to be a small green locust or other insect. When it burst out of the reeds I was ready for the shot but couldn’t believe what I saw when this long snake dropped out of frame. I kept on tracking the bird and managed to get 2 frames where the whole snake was visible and the wing position of the bird was favourable. 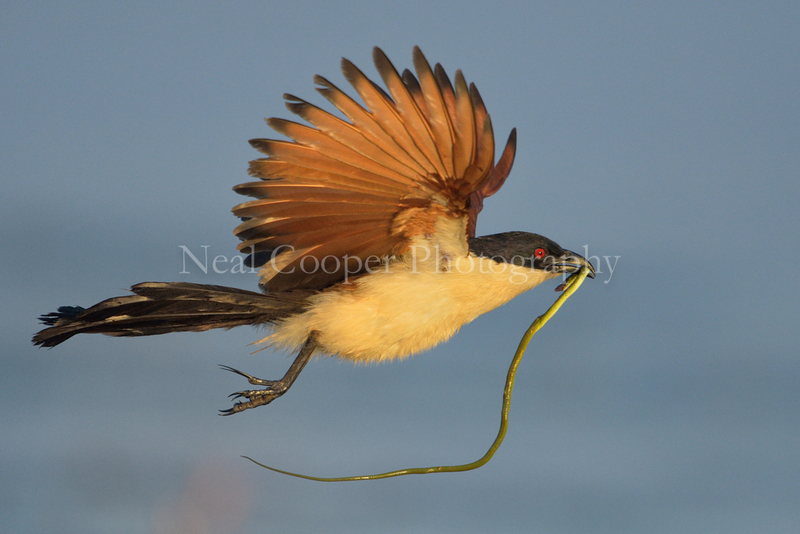 A Coppery-tailed Coucal flies across the Chobe River carrying a Green Water snake. Then there are two images from the Kgalagadi Transfrontier park. 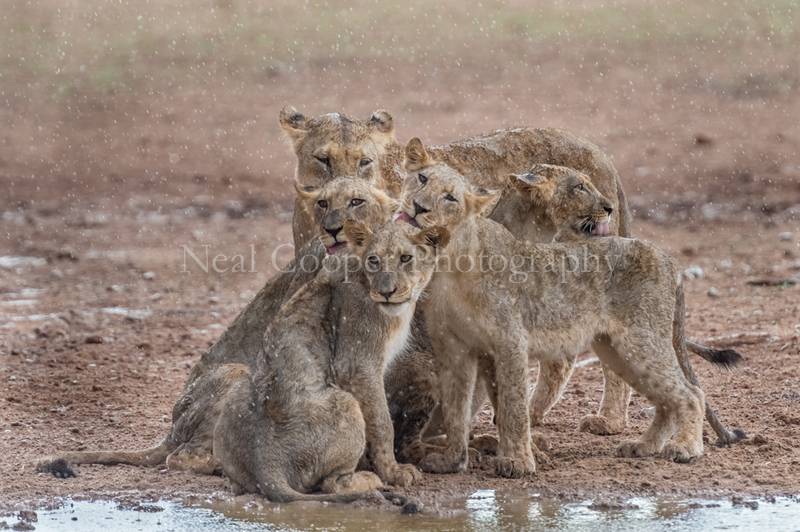 The first image is of the 4 lion cubs and their mother sitting in the rain. The image came about when we were waiting at a waterhole in the Kgalagadi and a huge thunder and dust storm hit us. Ons the wind had subsided, the 5 lions appeared out of the rain in the distance. They slowly made their way to the waterhole, but every few meters, they would stop and lick the water off their siblings coats. Even when they were sitting right next to the water hole, they continued to lick the water off each other. The 4th image is a special one for me as I had made many trips to the Kgalagadi in the past and had never seen this behaviour where the Jackals were hunting the Cape Turtle Doves and Sandgrouse. When I made an impromptu visit in January 2015 with a friend we were rewarded with seeing this behaviour on a number of days. So we decided to go straight to this waterhole every morning and wait. Photographing this behaviour is challenging as the Jackal’s approach, charge and subsequent lunge towards its prey s very erratic and even if you are able to track the attack you invariably have a number of fleeing birds in front of the Jackals face. This image was the best of the many attacks we photographed and one that was very rewarding in capturing. 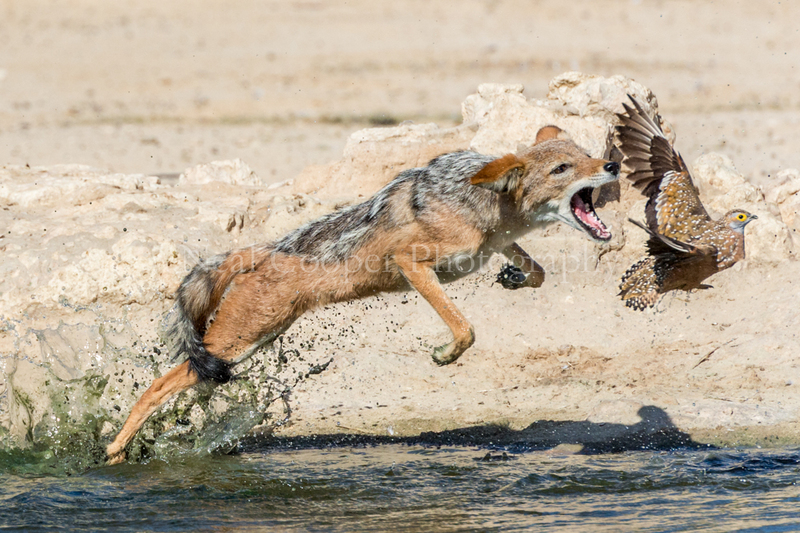 A Black-backed Jackal hunts a Sandgrouse. I look forward to travelling to Austria to attend the awards ceremony in Linz in October and meeting so many great photographers. I am deeply honoured to have received the recognition of this once in a lifetime award. Nature photography is a passion and something I don’t want to live without. Sharing these incredible experiences in these wonderful destinations with our CNP clients is a real thrill for me and something I don’t tire of. I am a Nikon shooter and all the images above were captured with Nikon my D4 or D800 and 600 f/4.0 and 70-800 with 1.4 extenders. Feel free to visit my website to view more of my images or send me an email for any enquiries on our Photographic Safaris. Wow! Very impressive Neal. And well deserved!! CONGRATULATIONS!